From the age of 13 Rinpoche practiced dzogchen under the guidance of masters from both the Bon and Buddhist schools of Tibet, including (from Bon) His Holiness Lungtok Tenpai Nyima, Lopon Sangye Tenzin Rinpoche, Lopon Tenzin Namdak Rinpoche, and Geshe Yungdrung Namgyal. From his early adolescence until young adulthood, Tenzin Rinpoche was raised like a son by his root teacher Lopon Tenzin Namdak Rinpoche, today revered as the most senior teacher of the Bon tradition. An accomplished scholar in the Bon Buddhist textual traditions of philosophy, exegesis and debate, Tenzin Wangyal Rinpoche in 1986 completed an 11-year course of traditional studies at the Bon Dialectic School of Menri Monastery, where he received his geshe degree, equivalent to a doctorate in philosophy from Western universities. Upon graduating, Tenzin Rinpoche was employed at the Library of Tibetan Works and Archives at Dharamsala, India. That same year His Holiness the XIV Dalai Lama appointed Rinpoche to be the Bon tradition’s representative to the Assembly of Tibetan People’s Deputies of the Tibetan-Government-in-Exile. Tenzin Wangyal Rinpoche was one of the first to bring the precious Bon teachings to the West. In 1991 Tenzin Rinpoche was awarded a Rockefeller Fellowship at Rice University in Houston, Texas, where he continued his research into early Bon tantric deities and their relationship to Buddhist traditions in early Buddhist Tibet. He was awarded a second Rockefeller Fellowship in 1993 when Rice University invited him back to teach during the spring semester. 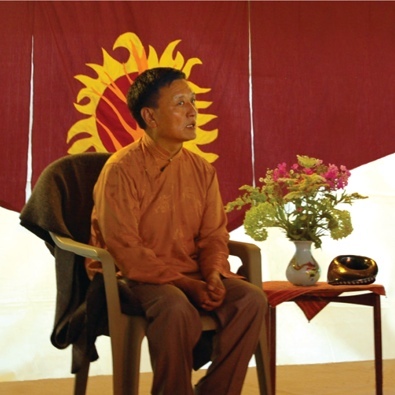 In 1998 Rinpoche established the Serenity Ridge Retreat Center. Since that time Tenzin Rinpoche has chosen to remain in the West to teach the ancient Bon traditions to Western students. In March 1992 Rinpoche founded Ligmincha Institute in Charlottesville, Va., a nonprofit organization whose purpose is to preserve for future generations the ancient teachings, arts, sciences, language and literature of Tibet and Zhang Zhung. In 1994 he received a grant from the National Endowment for the Humanities. Today Rinpoche continues his dedicated efforts to preserve the Bon Buddhist tradition through establishing centers and groups worldwide, through translating and publishing texts, and through teaching Bon as an authentic, living tradition to Western students around the world. In 2013 he received the Wisdom Fellowship Award of the Sacred Fire Foundation.